My mother traveled about as far in her life as anyone I have known. She grew up in the rural South, with few traditional career-oriented role models, and in a family that dealt with substance abuse and clinical depression. Yet she ultimately found her professional calling as a fundraising executive for academic and medical institutions—a role at which she excelled. My mom had a special talent for communicating with eloquence and authenticity that enabled her to connect and develop meaningful relationships with people of all walks of life, including highly successful potential donors, board members of the institutions she represented, distinguished alumni, etc. Early in my own career, my mother gave me an incredible gift that, as is true for so many life lessons, I came to appreciate more and more with the passage of time. She consistently introduced me to people in her growing network. People, she knew, who were in a life stage where they were willing to give back and who were also in a position to impart some wisdom upon me—perhaps in a way that would be better received than the same advice coming from a parent. Awkward as it sometimes was for a teenager and later a 20-something, I took her up on her offer and met one-on-one with a few people each year who were willing to offer me their thoughts and words of wisdom about business and about life. I had a few standard questions, one of which was “what advice would you give somebody just starting out in their career?” One answer I recall was to “find your true north.” It sounded great but proved to be an elusive goal, especially for someone just starting out in his career. Having moved forward in my own career, I now find myself looking for opportunities to provide words of wisdom to those starting out. And I have adopted my own phrase to share—one that I have come to believe can serve as a model for achieving enduring success in business or in life: “There’s always time for talent,” meaning that it is an absolute imperative to make the time to develop talent—in yourself and in others. Whether you believe that human talent is innate, learned early on or developed throughout life, everyone knows talent when they see it, and people—as well as associations—with more talent certainly do better than those with less, all else equal. Talent is important and therefore worth understanding. While reality television seems to broaden the definition of talent with every passing season, traditional dictionary definitions of the word use phrases like “unique ability” or “special skill.” We all have something we do best, that thing we can leverage to achieve our “highest and best use.” In the superhero world, this is a certain special super power. For my mom, it was the warm, disarming style that served her so well in fundraising. Talent exists everywhere but identifying and developing it is a process and takes work. Despite its title, Geoff Colvin’s bestseller, “Talent Is Overrated,” is not a treatise against talent; rather, it argues against the concept that talent is innate, God given, etc. A central premise of the book is that the successful leaders, athletes, artists and executives profiled—those who have achieved extraordinary success and notoriety—seem consistently to have outworked their counterparts through what Colvin calls “deliberate practice.” His premise is that while potential is innate, realizing that potential is possible only through hard work. Spend time asking yourself and others to identify your most valuable skill or set of skills. What are those things that come naturally to you? What is your defining trait or skill? What can you do better than others can? Research has shown that employees who understand their strengths and who use them show higher self-confidence, altruism and overall well-being. They also perform at a higher level and are less likely to leave an organization. 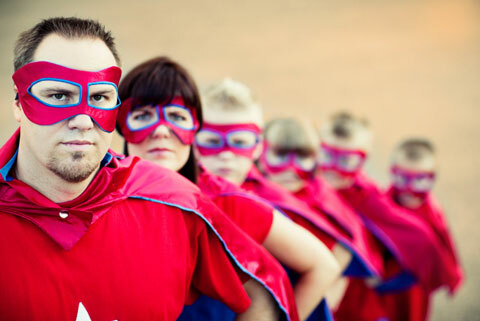 Like superheroes, most of us also have unique vulnerabilities—defining traits or tendencies that make us less effective in certain settings. For example, big-picture thinkers can have trouble with details, while detail-oriented people can have trouble making quick decisions. Even superheroes have vulnerabilities. The Incredible Hulk, for all his strength, has difficulty controlling anger. Superman, of course, loses his powers in the presence of Kryptonite and the Blade is weakened by exposure to direct sunlight. Understanding our own weaknesses is uncomfortable, and so many of us do not work to identify them. But self-awareness of blind spots is critical to achieving your potential. Interestingly, in “Talent Is Overrated,” Colvin cites research showing that people actually get worse at their professions over time when relying solely on their past experience. Said another way, relying only on innate talent and experience will eventually be limiting. Your Achilles’ heels can negatively define you in challenging times and improving on them—even modestly—can provide a sense of great personal achievement. Likewise, deliberately investing in improving those things you are good at is part of the necessary path to achieving your own highest and best use. Few people chose to both improve in areas that come easy and to improve in areas that do not, but the ability to do so is within everyone. It is a choice, (though, of course, the point I am making is that it really is not a choice at all!). If you are serious about growing and reaching your potential, you have no choice but to develop a plan to both identify and invest in strengthening your superpowers and your blind spots. The personal rewards and the potential impact on happiness, well-being and influence on others are too significant not to make time for this kind of growth. One of my favorite quotes, attributed to French photographer Henri Cartier-Bresson, reads, “Life is once, forever.” Working to improve yourself, your teams, your company or association is all about making it count. Matt Sanderson, president & CEO, SmithBucklin, has more than 20 years of business development, strategy and leadership experience. He joined SmithBucklin in 2010 and served as executive vice president of the Print Services & Distribution Association, a SmithBucklin client organization focused on the reseller supply chain for print, marketing and business communications. Most recently, Sanderson served as executive vice president & chief executive of SmithBucklin’s Business + Trade Industry Practice. Prior to joining SmithBucklin, he served as a director with Sikich Investment Banking (formerly Levi Littell Herbst & Company) where he worked with owners of small- and mid-sized businesses across a wide variety of industries.